Just like with us, learning is a process. From Puppy Classes to Therapy Dog Training, our small group classes allow individual attention to give you the opportunity to learn how to control your dog when it matters most. We are committed to teach your dog the skills needed to behave well in difficult situations and around distractions. Geared towards dogs 6 months and older, Doggie Elementary provides Fido a foundation of basic skills to learn good habits and behaviors. This 6 week course is ideal for older puppies and rescue dogs. No prior training knowledge is required on either the part of the owner or dog. Dogs will learn sit, down, come, leave it, wait, stay and walking on a leash without pulling. Canine high builds on the foundation of Doggy Elementary. Your dog has a reliable set of behaviors: sit, down, stay and come… When he's at home. Canine High will help your dog perform commands away from home and in distracting environments. This course prepares you and your dog to pass the American Kennel Club's Canine Good Citizen test, a certification program designed to reward well mannered dogs. This class teaches the skills needed to pass the CGC. The CGC can assist with therapy dog programs, pet housing, even home insurance savings. 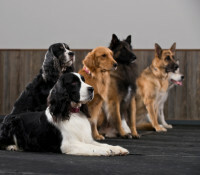 Perfect your dog's behavior in public with our community canine class. We visit dog friendly locations and put our training to the test! Dogs must have completed Canine High or equivalent. At the end of the course, you can opt to take the Community Canine Good Citizen (CCGC) test for an additional $10 fee Travel is required as the classes will meet at several different locations. This is for dogs with basic manners and desire to impress! You will learn techniques to teach your dog a variety of fun and useful tricks, from rollover, high five, take a bow, crawl, to put your toys away, fetch and go to a specific spot! Many behavior problems result from bored dogs whose potential awaits a creative release. Harness your dog’s intelligence and drive to work in the class that literally has your dog jumping through hoops! This clicker training course teaches tricks as a great way to build the bond between you and your dog and improve response time. Learn bow, wave, spin, yawn, touch and more. This class offers training towards a therapy dog certification through Therapy Pets Unlimited. Once you and your dog have passed the TPU exam, you will be assigned to a local facility where you can volunteer. All dogs must be both dog and people friendly and have completed Canine High or equivalent.